I usually like to bring cash to top off my SmarTrip card when it’s running low, but I forgot to grab a 20 out of my closet this morning so I used my credit card at the fare machines on the 7th Street side of the Shaw station. First try: “Not approved.” Thinking it was a fluke, I tried again—no go. I moved to a different machine, same result. Gave up and got on the train anyway, since the $4 I had on my card would cover a one-way trip. Got a text from Bank of America a couple minutes later with all three attempts listed as suspicious activity. BofA declined one of those attempts, but the second and third (one of which rang up as $0) were both approved by the bank, although the SmarTrip machine said they’d been declined. It’s been said that when the going gets tough, the tough whip out their phones and fire off some snarky tweets. 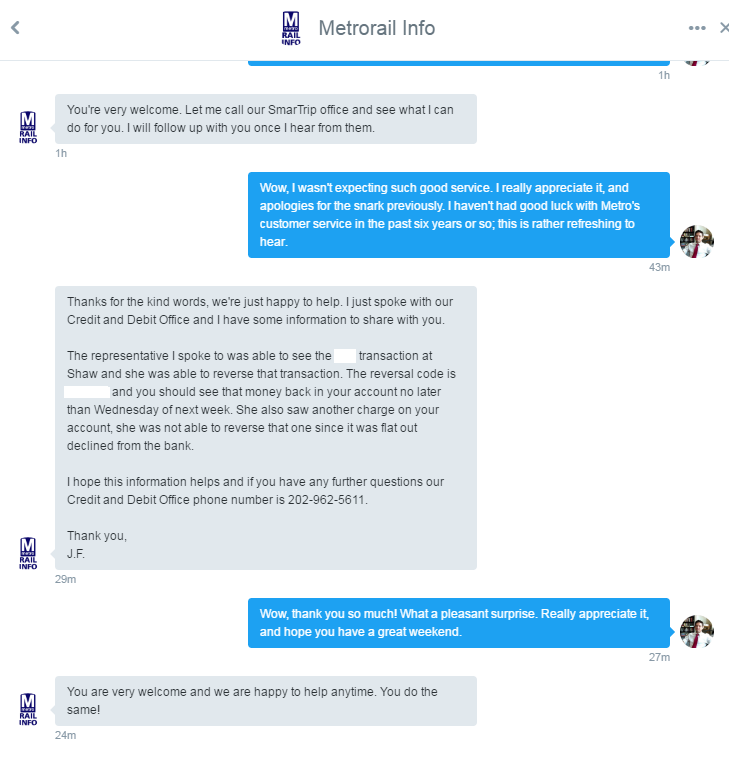 A little while after that, @Metrorailinfo reached out to me and invited me to explain in a Direct Message, which I did (selection attached). Fifteen minutes later, they hit me back with a note from the Credit and Debit Office saying they were able to reverse the non-$0 transaction, and they even gave me a confirmation code. I’ll be watching my card to see what happens during/over the weekend, but I thought it might be worth sharing to encourage others to reach out to WMATA via social media with more substantive complaints than “my train’s stuck in a tunnel” because this is the first evidence I’ve seen of that proposed post-Labor Day social-media-based customer service blitz actually working.